"Do you have unsolved problems, petitions, complaints, or suggestions? Send them to the Prime Minister of the Republic of Uzbekistan." That's the message on the website of Shavkat Mirziyoyev, Uzbekistan's acting president. And frustrated Uzbeks have responded in their thousands. They've been flooding the site, a telephone hotline and Mirziyoyev's Facebook page with complaints about matters big and small - everything from wages and corruption to noisy discos and business opportunities. It all comes against a backdrop of elections on Sunday - Mirziyoyev is widely expected to win a full term as president - in a country where media is tightly controlled. The acting president has garnered more than 53,000 likes on his Facebook page since its launch in late September, the highest number any public official has collected in the country. His social media presence and the hotline initiative seem to have provided an outlet for Uzbeks stymied by corrupt officials and mind-numbing bureaucracy. To date the virtual office has received more than 220,000 complaints. "I need your help. I am older and getting married," the request reads. "My salary is not enough for me. So please give me a pay rise, and it would also be good if you could give me tickets to Malaysia for a honeymoon." Another complainer gripes about being unable to buy a car from a dealership with a debit card. There's a chronic shortage of cash in Uzbekistan due to high inflation. "I request you to issue an order to close night discos," another citizen writes. "I also have a personal request. I would like to manage an engine oil service shop. Can you please give me the Castrol shop located on Archa Street [a well-known shop in the capital Tashkent]? The owner of the shop earned lots of money for many years. I also want to become a rich man." The acting president has guaranteed that each and every enquiry will be dealt with by his administration. But already there are posts from people who say that their voices are not being heard. "My brother sent two requests regarding buying foreign currency from a bank," wrote Jamik Bakalavr. "The requests have not been dealt with yet." Barno Yoldoahevna complained: "One needs to have good connections or a lot of money to achieve the truth in Uzbekistan." 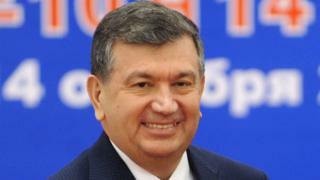 Mirziyoyev was appointed interim president in September, after the death of Islam Karimov, who ruled for 27 years. With no genuine opposition candidates allowed to take part in the election, Mirziyoyev is the overwhelming favourite to win - although the vote is not likely to be recognised as free and fair by international watchdogs. Human Rights Watch describes Uzbekistan's human rights record as "abysmal", citing limited freedom of expression, forced labour of children and adults, endemic torture in the criminal justice system, religious persecution, and discrimination against lesbians, gays, bisexuals, and transgender people. And according to another recent study Uzbekistan has one of the most tightly controlled online and media environments in the world. Uzbek journalists face censorship, intimidation and violence, and one, Malohat Ehonqulova, has used the acting president's initiative to send repeated requests for help. Ehonqulova was dismissed from a state-run TV channel in 2010 for speaking openly about corruption, censorship and bribery. She's asked for her and a colleague to be reinstated to their jobs - but says she hasn't yet received a reply. Many Uzbeks are wondering if Mirziyoyev's direct, hands-on approach to politics - quite a departure from the style of the late Karimov - is born of a genuine desire to help or is just plain electioneering. Mirziyoyev announced on his Facebook page that a number of government employees had been reprimanded for negligence in dealing with the complaints and that some officials had been fired. He also ordered that all heads of ministries, government agencies and municipal authorities must meet members of the public each day until 11:00 to hear their concerns. There has, however, been no shortage of scepticism in a country where elections rarely change anything. Eltuz, a satirical, web-magazine which says it reflects the political mood in Uzbekistan, published a cartoon mocking those hoping for big results. It depicts an Uzbek peasant with a hoe who is asking for a job from the leader. The speech bubble reads "Daddy, let me join your team. I will axe injustices, unfairness, bribery, selfish careerists, disrespect, fraud, and nepotism in our country in a week." Blog by Sarah McDermott and Azim Rakhimov.